We finally got hold of a wash kit for Tammy Norie’s engine. A wash kit allows the engine to be flushed through with water from a hose (cleaning out salt) and also allows the engine to be tested out of the water. This gave us an opportunity to test the nose plugs we made earlier that prevent fumes blowing back into the engine compartment and cockpit. Thanks to Martin at Hendy Honda Marine who helped to identify the engine and found the part in a warehouse in Belgium, as well as putting together a nice spares kit. We didn’t know the age or condition of the lifejackets we received with Tammy Norie, so it was time to test them. They passed and were still nicely inflated 24 hours later. Thanks to Versatile Marine for their servicing video. Every boat needs a stamp, I think. 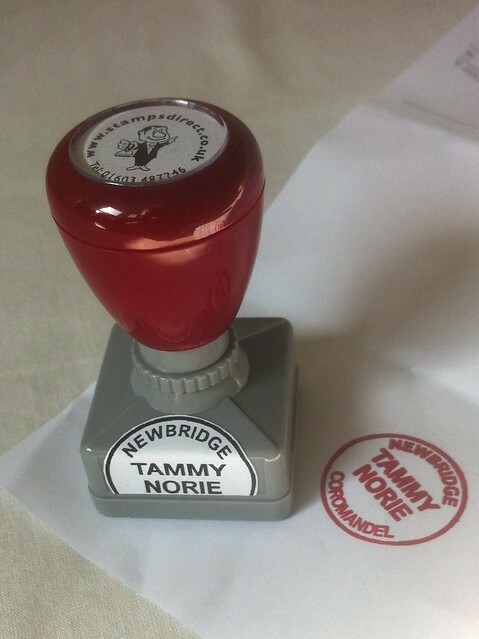 I just got back from skippering in Sweden and found that Stamps Direct had delivered my order for Tammy Norie. They worked from custom Photoshop artwork I made and have excellent customer service. Raising the mast and sail now that the hinge has been reinforced. This is an easy one-person job now, though I have yet to try it in the water. It would be much quicker than shown in the video if I wasn’t fiddling with the sail cover, too. This video shows an experimental mast gallows made by crossing the oars with a bungie cord. It seems like a good way to keep the mast out of the way while travelling with it down. 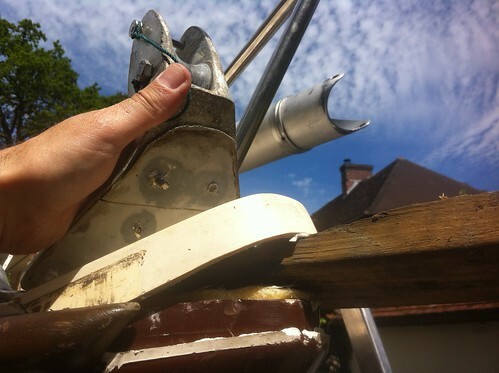 30kg force is required to lift the mast when standing on the sliding hatch. 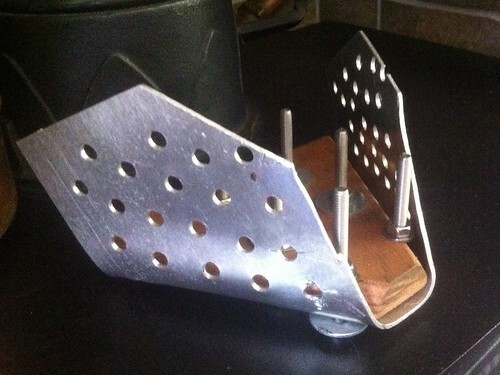 I measured this with a 100kg spring balance I found in a hardware shop for £3 — very handy! The summer sailing plan for Tammy Norie is taking shape. Firstly, I’m keeping an online calendar of plans that you can subscribe to if you like. The next few upcoming events will also appear on the side of this blog. Next week I’ll be skippering a sailing trip in the Baltic with the Cambridge University Yacht Club, so Tammy Norie will have to wait in my parents driveway for a little longer. Though I live in Cambridge I’m hoping to join the Fareham Sailing and Motorboat Club and moor Tammy Norie in Portsmouth Harbour. This is close to my family, offers sheltered sailing for my nephews and niece, and my uncle is already a member. I visited the club and very much liked the people but they don’t hold membership meetings very often and I’m having to be patient. I’m hoping we will sort out membership and mooring by September. So in the meantime I’m going to explore East Anglia. The plan is to launch on 4th July at Woodbridge on the beautiful Deben. We’re going to try a launch directly from the road trailer this time, without a crane. It should be an interesting exercise! We’ll probably try a partial retrieval too, just to get an idea of the problems. (I’ll write about my launching trolley ideas later.) The rest of the weekend will be spent exploring the Deben and possibly taking a trip to a neighbouring river. I’m keen to put Tammy Norie through a few more trials. I have some friends going to the Latitude festival near Blythburgh on 19th-20th July. A bit of research (thanks, Dylan Winter) revealed that I can sail Tammy Norie to Blythburgh from Southwold by ducking the mast under the old railway bridge. So that’s the plan for that weekend. Southwold itself looks like a great place to visit. If conditions are poor I might go to Aldeburgh instead. The Junk Rig Sailing and Rally Club are holding a rally at Bradwell on the 26th-27th July so I’ll take a long weekend to explore the area as well as meeting a bunch of other junk sailors. I don’t know if Mingming II will still be in England then, but I’d love to take a look at her. After that I have friends taking a holiday in Sheringham for the week of 4th August. An excellent excuse to sail right around the coast to Blakeney and Wells. By that time I should have a pretty good idea of Tammy Norie’s sailing capabilities so a longer trip should be very feasible. After that the plans are more vague, but I’m quite keen to bring Tammy Norie home to Cambridge! From Blakeney it’s a short sail round to King’s Lynn and the mouth of the Great Ouse, which joins the Cam south of Ely. It would be quite something to see her in Cambridge and I might even be able to get her and my house in the same photo with careful angles. If I do sail to Cambridge we’ll probably haul her out nearby and trail her to the Solent rather than trundle all the way back. This plan is slightly confounded by the separate regulation of inland waterways. To take Tammy Norie to Cambridge I’ll need a boat safety inspection, an Environment Agency licence, and a special licence for the Cam too. These are significantly more expensive because Tammy Norie has quite a big engine for her size at 10hp. It’s almost worth buying a smaller engine just for the savings, and I’m looking in to that. The alternative plan is to sail from Blakeney to Portsmouth in stages. There’s be plenty to see and do that way as well. I wrote earlier about how I managed to break Tammy Norie’s nose by sweating on a line between it and the mast head. 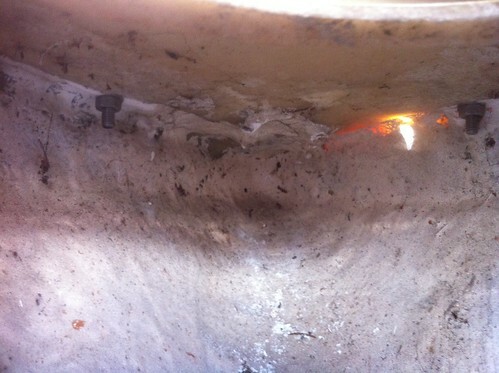 We’re not only repairing the damage but making the whole fitting much stronger. 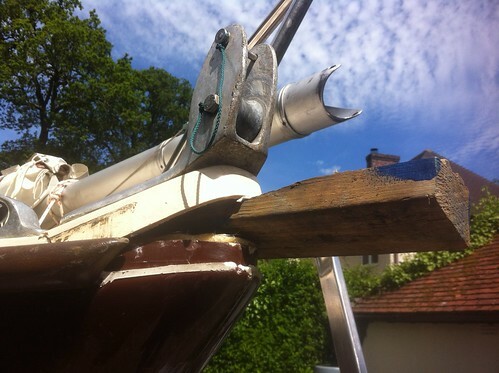 Here’s a picture of the damage, with me pushing upwards on the anchor fitting. It took us a little while to understand what was wrong. The deck isn’t secured to the hull at the stem head except by a thin line of sealant. 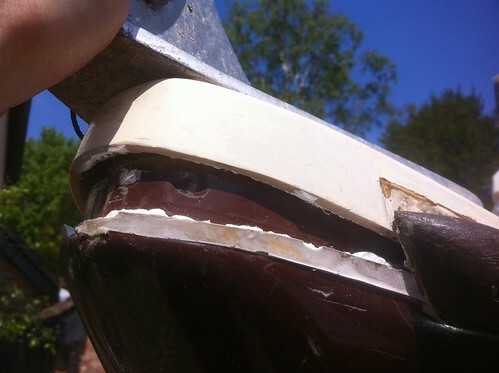 The deck joint has fixings behind the rubbing strake (which you can see at the bottom right) and seems pretty secure in general, but there’s nothing holding the deck down at the nose except general stiffness of the fibreglass. At this point we could have squirted a load of epoxy into the gap, squashed down the deck, re-sealed the joint, and hoped for the best. But my principle for Tammy Norie is to fix any damage stronger than before. So I planned to replace the machine screws that hold down the anchor fitting with longer ones that go right through into the anchor locker, and through a reinforcing backing plate. The original machine screws only go through the deck. Here’s a picture of the inside of the anchor locker looking forward. You might just be able to make out some bumps in the fibreglass at the top. 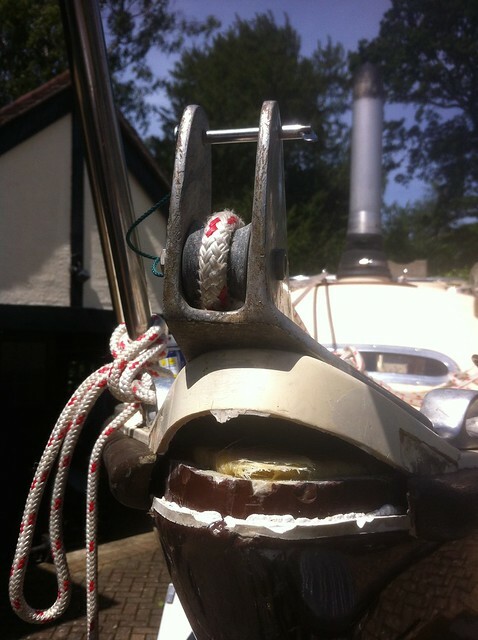 After bolting down the anchor fitting, Newbridge made a reinforced fibreglass bubble for the anchor locker, glassing over the nuts! 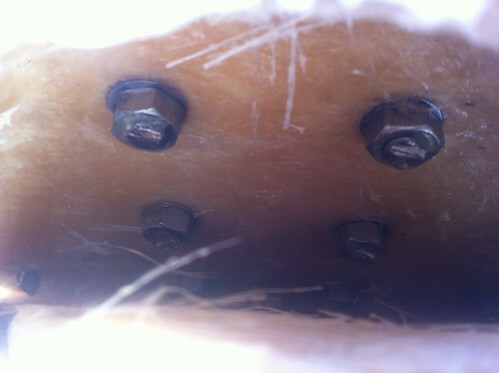 This makes the anchor fitting very hard to remove, as the nuts just rotate and you can’t get a spanner onto them without grinding through the anchor locker. This part of the locker is very small and hard to reach. It’s a terrible bit of unmaintainable design. Dad and I discussed what to do. Even if we drilled out the stainless-steel machine screws (an awful job) the nuts would still be floating around. Since the damage had partially cracked the deck along a line behind the anchor fitting, I thought perhaps we should just cut right through it, remove the section of deck, then attempt to make the whole thing good after bolting it down. That would have been another big job and difficult to get right. A week or so later I realised that when I’d ripped up the fitting I saw it rise to an angle of about 40 degrees. Given that the alternative was making a cut, I should just try prying it open to see if I could reach the nuts. There wasn’t much to lose. So I rigged up a rope from the fitting and pulled it tight. What lovely shiny teeth you have! The “tongue” you can see is the top of the anchor locker bubble. We were able to get a spanner onto the nuts and undo the machine screws, removing the fitting. To get the last couple of screws out I used a wedge to keep her mouth open. With this done we were able to drill the holes through to the anchor locker. I started making a template for a backing plate from cardboard. 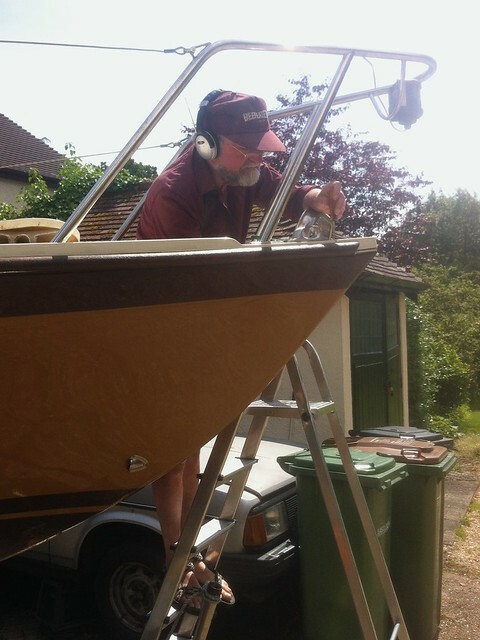 Dad took over most of the work from here as I was busy making the new mast hinge. 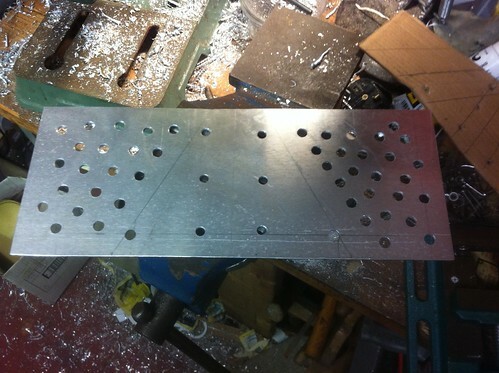 Here’s the finished template and the aluminium plate he cut. I had a lot of fun drilling the perforations. 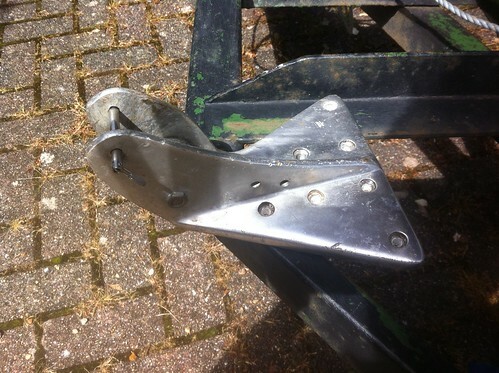 These are intended to capture resin and fibreglass to increase the strength of the bond between the plate and the hull. At this point I tried to bend the plate in the right place, but it was incredibly hard to get a good fold because of the awkward shape. Dad made a jig from some hardwood, annealed the plate, and did some hammering. The result: one rare specimen of the anchor backing plate moth! You have to imagine this turned upside-down and inside the anchor locker, pressed to the ceiling. 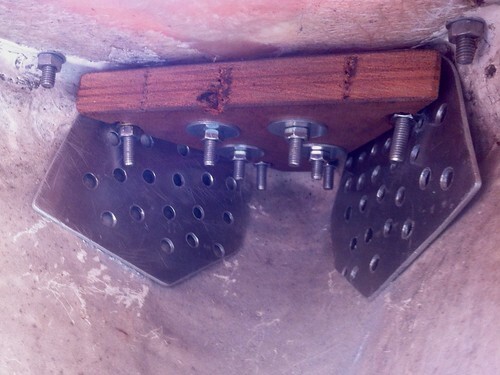 The machine screws come down through the anchor fitting, the deck, and the ceiling, then through the plate and onto their nuts. We haven’t decided whether it’s worth keeping the hardwood block as well. It’s already a tight fit and it took quite a lot of work to get the plate into position. Edit: Here’s a photo taken later of the moth in position. So far that’s as far as we’ve got. The fitting is bolted down and already more secure than before. We could, at this stage, re-seal the deck joint, seal the machine screws, and call the job done. But that’s not good enough. 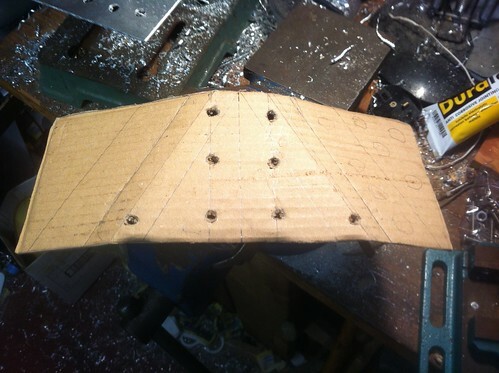 At the next opportunity we will add a layer of fibreglass over the plate, and especially over the perforated “wings” so that the anchor fitting is connected firmly to the hull as well as the deck. It should then be able to take a reasonable amount of upward load, allowing us to experiment with headsails without worry. I’ll post pictures when the job is done. I must say I was nervous about the deck lifting just from the boat bouncing on its mooring, hence the upgrade. Declan has gone for an external reinforcement with his anchor fitting on top. You can find more details, including a CAD drawing, at the Corribee & Coromandel Discussion Group on Yahoo.